Powers/Abilities: The Missing Link has superhuman (Class 75-100) strength and durability; his body is composed of a glass-like material, fused into a solid shape by the enormous heat that he generates. When struck with sufficient force, his body will shatter into small crystals, but they will usually reform eventually. He gives off radiation, which is sometimes low enough that it gradually causes sickness in those around him, and is sometimes high enough that the Hulk would burn his hand upon touching him. He has limited education and, while generally peaceful, becomes angry and violent if he perceives a threat to himself or his family. Under certain situations, the radiation in his body has been neutralized, but this has often proven temporary. (Incredible Hulk II#106 (fb)) - Countless millennia ago, he was a "Neanderthaloid" struggling for life on a merciless planet, until he was sealed in an underground pocket during a volcanic eruption, somehow surviving the succeeding time period. (Incredible Hulk II#105 (fb)) - The Red Chinese performed an atomic test, which caused a rift to open in the ground into a deeper magma pocket, which spewed to the surface. A few days later, a bestial form crawled from fissure; it was subdued by military scientists via gas pellets and brought in for testing, in the process mutating into a radioactive monster. Realizing that they would not be able to keep the monster under control when it awakened, the Red Chinese government placed the creature in a lead-lined capsule and placed aboard a freighter of a satellite nation (apparently Russia or a nation in the former USSR). (Incredible Hulk II#105) - The communist crew of the freigher launched the capsule towards New York's harbor, where the Missing Link emerged and went on a rampage. It soon encountered the Hulk, whom it saw as a threat and attacked. The two seemed comparable in strength, but while the Hulk could shatter parts of the Missing Link, his body burned every time he touched the creature. 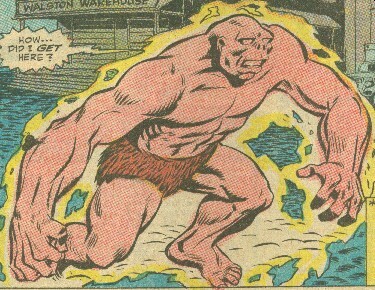 When the Missing Link bear-hugged him, the radiation briefly turned the Hulk back into Banner. When he turned back into the Hulk and attacked anew, he seemed to gain the upper hand. However, Major Talbot used a Reed Richards-designed radiation neutralizing device to turn the Hulk back to Banner, seeming for good, leaving Talbot alone to battle the Missing Link. (Incredible Hulk II#106) - The Missing Link's radiation turned Banner back into the Hulk, but both were then captured by the Russian equivalent of SHIELD. Under Col. Yuri Brevlov's command they pulled the two into their helicarrier, but the Hulk quickly broke free, and the ensuing battle released the Missing Link as well. The radiation within the creature had built to critical mass, and it exploded, taking half of the helicarrier with it. (Incredible Hulk II#179 (fb)) - The Missing Link's body exploded into thousands of tiny pieces which fell to Earth, landing and eventually reconstructing itself in the Appalachian woodlands in Lucifer Falls, West Virginia. He was found by a warmhearted family, the Brickfords, who took him in, never questioning his inhuman deformity or his inability to speak (he could speak at the time, actually; not English, but some sub-human dialect). The Brickfords tutored and cared for him until he was sufficiently interactive to take a job in the mines. The Brickfords named him Lincoln. (Incredible Hulk II#179) - The Brickfords found and took in Bruce Banner (after the Hulk had fallen from the sky during a prior battle). Bruce met Lincoln, but didn't remember who he was until Jimmy-Jack Brickford fell sick from radiation poisoning due to his chronic exposure to Lincoln's whose radiation levels had been slowly rising. Banner examined the sleeping Lincoln with a Geiger counter, confirming his suspicions. However, when he tried to explain to Lincoln that he was a danger to the town and that he must leave, Lincoln refused to believe him, inadvertently shoving him into mineshaft. 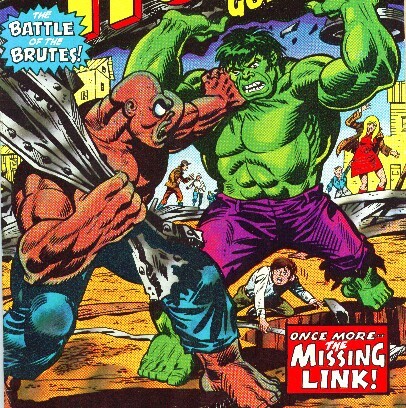 The Hulk soon emerged and battled the Missing Link, their struggles shattering the ground over the mines, causing a cave-in. As his touch burned the Hulk, the Missing Link realized that Banner had been telling the truth, just as his radiation levels reached critical mass and he exploded once again, shattering much of the mining buildings above them. When the Hulk and the Missing Link crawled from the wreckage, the Brickfords and other residents of Lucifer Falls assumed the Hulk had caused all of the damage and the child's sickness, and that Lincoln had only been protecting them. However, his radiation had been spent once again, it would be some time before he would be a threat once again. The Hulk left them in peace. (Rom#29 (fb) - BTS) - Lincoln continued to live with the Brickfords and work in the mines, until the ground began to crack and the mines leak toxic fumes. People began to leave, and those who didn't got sick and died. Diagnosing the fumes as radioactive, Clay Brickford, still thinking the Hulk had caused their previous problems, figured the Hulk had returned to the mines. Lincoln, however, realized that he was the cause again, and he volunteered to "search the mines for the Hulk," and he remained in the mines, hoping to protect the others through distance. However, eventually his levels raised high enough that they still threatened the town. Everyone left except the Brickfords, who grew deathly ill from the radiation poisoning. (Rom#29) - The spaceknight Rom sensed the radiation while in Clairton, West Virginia, and followed the trail to Lucifer Falls, using his neutralizer to purge the Brickfords of their radiation poisoning, curing them. After learning of Lincoln, Rom went down into the shafts, and explained how he was actually a threat to the entire planet. However, when he pulled out his neutralizer, the Missing Link mistook his intent and attacked him. After a short struggle, Rom used his neutralizer to purge Lincoln of radiation as well, which had the side of effect of removing his knowledge of his responsibility for the radiation. Rom returned him to the surface, and the Brickfords accepted him once again. To maintain the belief in Lincoln's innocence, Rom confirmed their belief that the Hulk had been the cause again, telling them that he and Lincoln had driven the Hulk away. 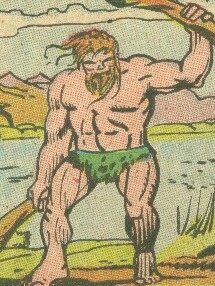 (Savage Hulk I#1) – Missing Link was part of a large group of villains that attacked the Hulk at court in New York City. (Thunderbolts I#34 (fb) - BTS) - The town was unable to be rebuilt, and the Brickfords were forced to turn Lincoln over to the authorities when they moved out west. Comments: Created by Bill Everett, Roy Thomas, Marie Severin, and George Tuska. The dialogue from Clay Brickford in Thunderbolts I#34 would seem to indicate that he knew that Lincoln was the Missing Link following Hulk#179. Perhaps they believed him to have been cured and denied all evidence to the contrary. It is called the missing link because it was supposed to represent the evolutionary connection between Homo sapiens and more primitive hominids. Neanderthals were allegedly around from 190, 000 BC - 28, 000 BC, so the Missing Link would seem to have originated from that time period. The story made it sound as if it would have been on the earlier than that. Clay Brickford and family showed up again in Thunderbolts I#34, seeking vengeance on Banner and the Hulk for ruining his life. Missing Link has an entry in Marvel Legacy: The 1970's Handbook.